Increase the speed of Firefox : PC Tricks ~ My Media Centers-PC & Android Games & softwares,Movies, Tips And Tricks & Much more.. If you have a broadband Internet connection and use Firefox you can decrease the time each web page you visit loads by enabling pipelining. 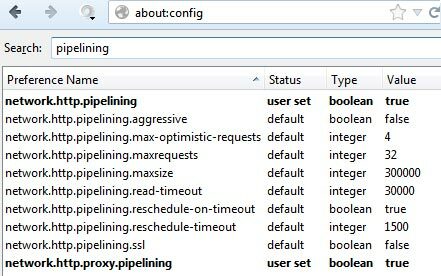 Pipelining will make Firefox load more than one request at a time for each page it loads. In other words if the page you are visiting has dozens of images it will load more than one image at a time, making the web page appear faster. Follow the below steps to enable pipelining in Firefox. In the address bar type about:config and press enter. In pipelining in the search box, as shown below. Double-click network.http.pipelining to set the Value to true. Double-click network.http.proxy.pipelining to set the Value to true. Make sure network.http.pipelining.maxrequests is set to a value of more than 30. Right-click in an empty portion of the about:config window and click New and then Integer. Enter nglayout.initialpaint.delay as the name of the integer and for the value make it 0.